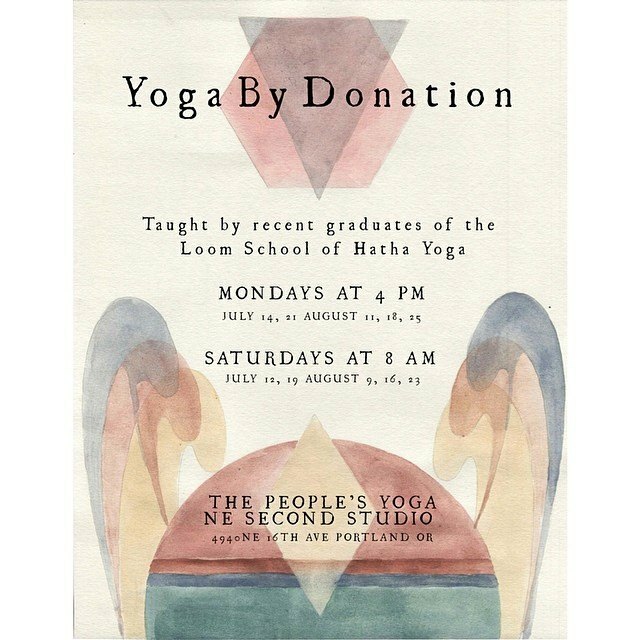 The Loom School of Hatha Yoga is a Yoga Alliance Certified Yoga School at the 200 hour level, with plans to expand to the 500 hour level in 2015. Our Yoga Teacher Trainings are designed to help you add to your existing toolbox of skills and strategies for engaging with the life you’re in, or for re-imagining that life to better suit you. As a Hatha Yoga School, we teach the practice of asanas (poses) with an emphasis on biomechanics, pranayama (breathing) and the meditative arts, as well as the history and mythology of yoga practice, and multi disciplinary wellness and healing modalities. In time, we hope to offer programing with an emphasis on applying the principles of yoga to your creative life. See our trainings pages for details about current programs. As of this writing, the Loom School is in its infancy, and we are fine tuning our mission statement to put out into the world, we hope, in early 2015. Our inclination is toward community and growth. If you would be interested in affiliating yourself with the Loom School, please feel free to get in touch, and we will keep you posted. Namaste. The Loom Yoga Immersion and integration Intensive is a one hundred hour program covering alignment in asana, the basics of pranayama, meditation, mantra, and mudra, the foundations for personal ritual building, an overview of applied anatomy, and a introduction to the teachings of the some of the central texts of Yoga. We will also follow the mythical thread of Siva Nataraja, a tale central to numerous traditions, and meet a few key players in the vast body of Hindu Myth. Though text, story and image, we will examine Yoga as a way of access to and engagement with our intrinsic creative impulse. This course is appropriate for serious students of any level, as well as teachers and would be teachers, under the premise that each participant brings to the group the richness that only their perspective, their urge to grow, and their way of being in the world can offer. Independent study projects may be assigned for further inquiry on a student by student basis, to be completed and shared at your discretion. This course stands alone as a deepening of your commitment to your personal growth and a refining of your unique gifts, and also serves as a prerequisite for both our basic and advanced yoga teacher training programs. For those on a teacher track, completion of assigned projects will required. Taught by Alison Alstrom at The People’s Yoga. Spring 2015 dates & details will be available soon here and on The People’s Yoga website. Teaching is, inherently, a conversation. As teachers we seek to respond to the needs and predilections of our students, while remaining steadily anchored in our personal truth. The process is always alive and shifting, and one of the most rewarding of human endeavors. While there are as many ways to yoga as there are yogis, a good teacher comes to the conversation with a solid foundation of self understanding as well as a facility with the subjects at hand. This course includes an introduction to anatomy and applied anatomy, the basics of therapeutic alignment, pose observation and instruction, sequencing, pose improvement and assists, as well as a deepening look at the texts, myths and history of yoga as they may be applied to the practice os knowledge sharing, an examination of ethics in teaching and practice,an introduction to the business of yoga. the Loom Immersion and Integration Intensive is a prerequisite for this course*, and together these two courses meet and exceed the yoga alliance standards for 200 certification. The Loom School of Hatha Yoga is very happy to be graduating its first class of yoga teachers. Please get to know them this summer.